Upper Deck and the Hockey Hall of Fame in Toronto are partnering for a promotion that celebrates the game's captains and gets game-used jersey cards into the hands of fans, visitors and collectors. On 30 select days this summer, the first 1,000 paying visitors to the Hockey Hall of Fame receive an exclusive card designed specifically for the NHL Team Fan Days promotion. Individual cards are only available for the one day. 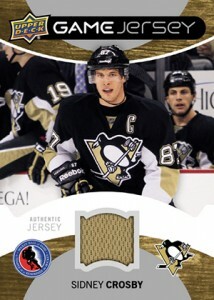 Each features a different NHL captain or alternate captain as well as a game-used jersey swatch. The cards go with a new exhibit at the Hockey Hall of Fame titled "NHL Captains - Class of 2013." The promotion kicked off on July 8 with Ryan Getzlaf of the Anaheim Ducks. The final card in the set, Andrew Ladd of the Winnipeg Jets, will be given out on August 23. Below is a full checklist of game-used jersey cards for the promotion as well as the day they're being handed out. the extra’s to the Hobby? Lee C � That would be a question for UD or the HHOF. I would guess that production was comparable to daily attendance. It wouldn’t make sense to do 1000 per day if the museum averaged 200 per day.